Since I have been cleaning in the sewing dungeon, I don't have a lot to show. 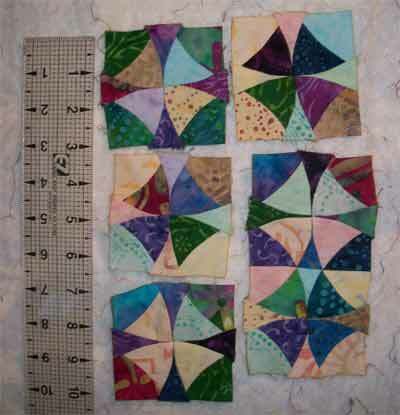 I found these little blocks made from a precut kit I bought last year in Paducah at the AQS show. 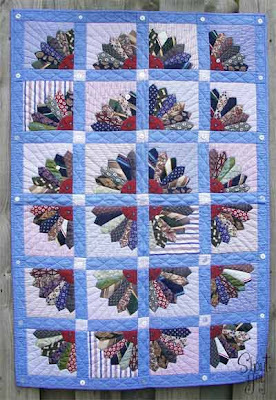 I think I'll have the rest of the pieces sitting next to my sewing machine and use the pieces for leaders and enders so I can get this quilt made! Other design walls can be found at Patchwork Times. I haven't made it into the sewing dungeon yet today because I had to get the Boybarian downtown so he could march in the parade. Man, patriotic parades make me tear up! When the WW II vets went by, I though of my grandpa and how much I missed him. He was a WW II vet, with a Purple Heart. Maybe I'll work on something patriotic this afternoon. In honor of my Grandpa. This week I've been trying to spend at least 20 minutes each day in the sewing dungeon cleaning, sorting, folding and putting away. Yesterday I found some orphan blocks that were left over from a swap. There were 4 blocks and a bunch of half square triangles. There were two four patches and fabric to make more. Instead of putting them aside or throwing them out, I put them together into a little baby quilt. I just added a bit of fabric from my stash, some leftover batting and - a quilt was born! I sewed the top together last evening and quilted and bound it late this afternoon. Kind of nice to have a quick project - and it cleaned out some spaces in my dungeon! Since our church is focusing this month on the Crisis Pregnancy Center in town, I'll just add this little quilt to the pile of goodies. May it bless a mom and her precious little one! take pictures of the quilt! 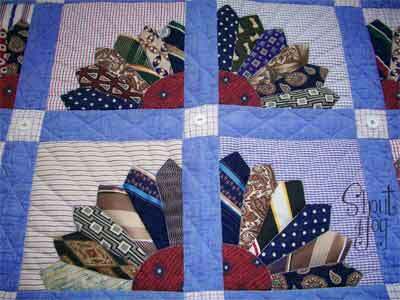 I am highlighting the I'm a Fan of Father's Day Ties quilt. 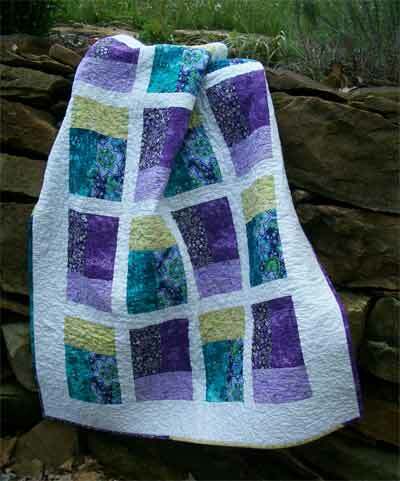 Many years ago, I made a similar quilt for a friend. She wanted a quilt to commemorate her father's retirement, using his ties. I loved the idea and wanted to someday make one for me. 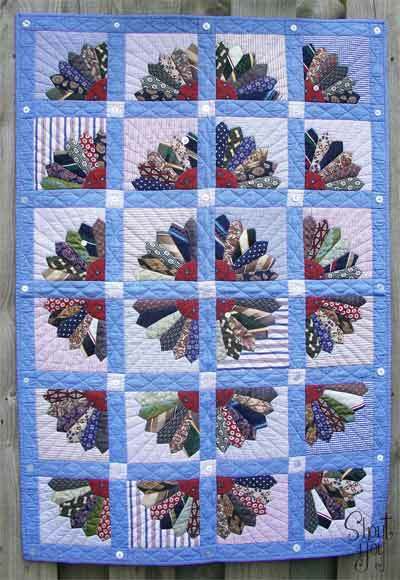 Since I was not doing much quilting at that time, I didn't quilt the quilt, I only tied it with buttons. I used the book Daddy's Ties by Shirley Botsford for my inspiration, but most of all for how to use the ties. She has great instructions on preparing the ties to use in other projects. 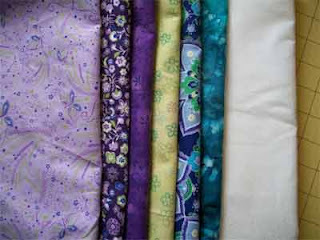 Working with silk, wool, cotton and polyester ties is not as easy as working with quilting cottons. They pose great challenges, especially as they are all cut on the bias - and fan blade pieces are also bias cuts. The pieces were always pulling this way and that, choosing to be wonky more often than not. This quilt was quilted on my old Bernina 930. 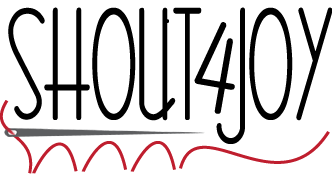 I still can't do consistent straight lines on my Voyager, so I wrestled with this one under the arm of my sewing machine. 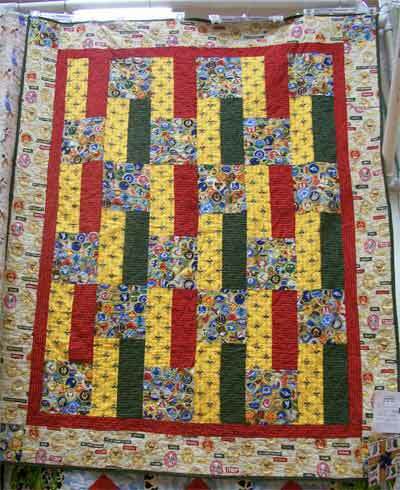 My walking foot was invaluable in getting this one quilted. I have called this quilt design Amanda Baby Quilt and worked up a pattern...my tester gave me feedback, I've changed up some things, and here is the quilt. 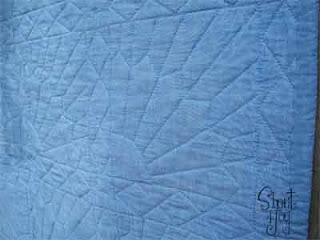 Writing instructions for quilt patterns takes a lot of brain power for me, much more than just making the quilt. I know some people pop patterns out all the time, maybe I'll find the process goes smoother as I do more. rather than work on something big or that I've already started, I wanted to do something small and creative, forcing me out of the traditional quilt box. 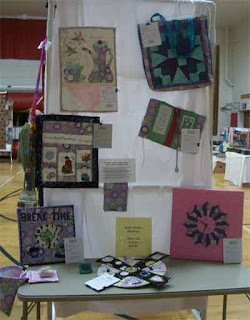 Then I remembered the Alzheimer's Art Quilt Initiative. My grandmother was afraid of Alzheimers. When dementia set in, she started cutting back on food, slowly starving herself. She faded away. My quilt is in response to my grandmother's life. I have the top finished. 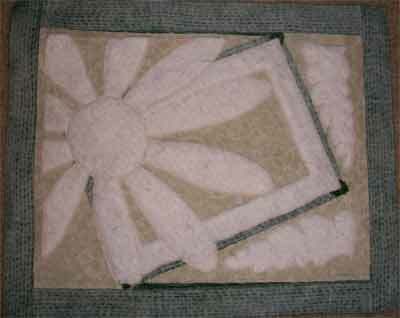 When quilting it, The flower will continue until the final border, but it has no color. The flower is fading out of the first frame, fading into the background. I have added trapunto to accomplish this. 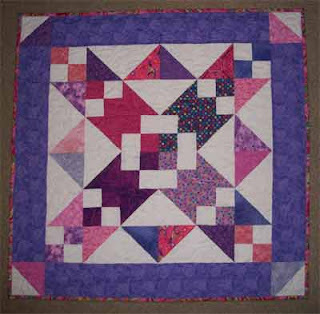 Now I am debating about whether or not to quilt the feathers into the other corners or to take the trapunto back off. AND which direction to hang the quilt. Is it horizontal? Is it vertical? does the flower fade up? or down? left? or right? Maybe I should take off the feather trapunto and bring that section of outer border closer to the tipped frame? These design dilemmas will keep my mind active as I move on through my day. Hopefully inspiration will strike sometime before I head to bed this evening. If inspiration strikes after I go to sleep, I frequently can't remember the solution in the morning! ...and an empty Design Wall. Well, it has lots of stray threads on it, but no blocks. 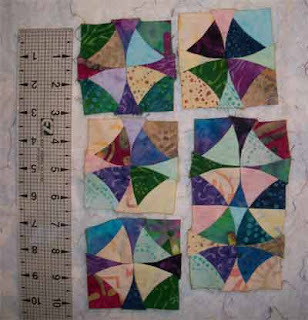 I have been working on a baby quilt, using these fabrics. I finished it up over the weekend and am working on a pattern for the quilt...so I have nothing on the design wall, because I haven't started another project (yet). For lots of design wall inspiration visit Patchwork Times. 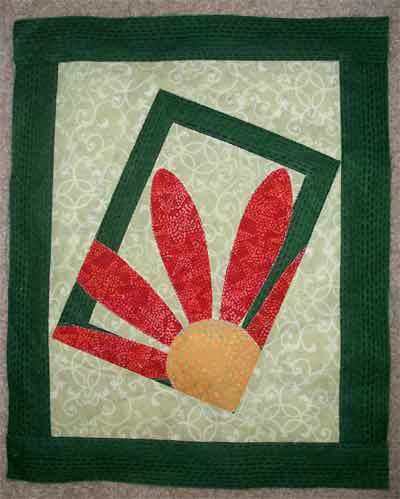 I'm hostessing another round of the Obnoxious Fabric Swap over on the about.com quilting forum. And I'm searching through my stash to find some fabrics to swap out. I'm thankful that I can swap fabrics out this way...I've come across some that I used in EVERYTHING for a couple of years and still seemed to have yards left, so I was tired of it, so I chopped it up and passed it on. I've also bought some that were so weird you have to wonder what the designer was thinking. And others that were nice, but really odd colors. It is fun to see what other people send in. Usually we have a lot of florals. I think we have so many because there are more floral fabrics than anything else out there. One time we had a bunch of fish fabrics, another time bugs and we had a lot of amphibians another time. I've had batiks, novelties, holidays...lots and lots of different fabrics. I'm looking forward to seeing what this bunch will be! Here are the entries for the guild challenge. THREE of us made clocks (so my idea wasn't very original). Mine was the Challenge winner, with another clock a close second - the clock laying down on the table. That black fabric is really a cool fabric and she found some really neat hands for her clock (she found them out East). Cinderella's Dream took First place in it's category and was Judge's Choice. I'm pretty proud of that little quilt! It took a LLLLLOOOOOONNNNNGGGGG time to quilt on my regular ol' sewing machine, but it did turn out beautifully! Fighting Dragons won the Blue Ribbon for the Art Quilt category. 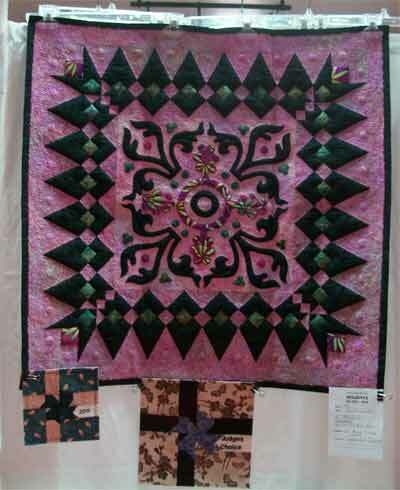 This one usually hangs on the Boybarian's wall, but he let me borrow it to enter in the quilt show. And, speaking of my favorite Boybarian, he won First Place in the Juvenile category. 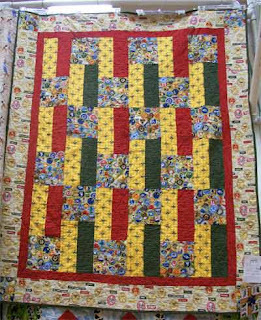 The judges even commented on how well he quilted it (so, it was worth taking out all those rows of quilting and redoing them!). I also had a blue ribbon on my tie quilt (the picture was horrible, I'll take a better one later this week) and a red ribbon on another quilt that I tossed on the pile at the last minute.